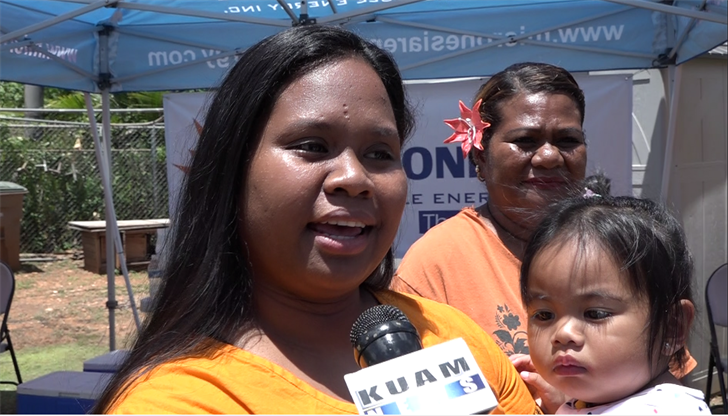 Home battery storage a step closer to getting off the grid - KUAM.com-KUAM News: On Air. Online. On Demand. It could be the game-changer for the residential-scale solar industry here. The Micronesia Renewable Energy company unveiled its first home with a battery storage system. That means the customer has access to solar energy, even when the sun goes down. "We've been waiting for this for a long time, its definitely the future for our industry," MRE's MRE's Jeff Voacolo said. He's referring to the battery back up system that's charged by the roof-top solar panels throughout the day, and can then power the home or building throughout the night. Voacolo said the batteries are designed to have more than enough reserve to last till the next day's sunrise. "The battery technology has gotten so good over the last couple of years that not only has price gone down 40 percent since two years ago, but efficiencies actually went up 50 percent," he said. Homeowner McEllen Alfred likes the energy security and resiliency of the battery system. For example, it means she'll have continuous power even during a storm or other Guam Power Authority outage. "I wanted to, first of all, save my food, and in the end, I wanted somewhere that my family could charge their phones and we could stay connected with our families," Alfred said. Voacolo said the battery systems also help GPA because they add even more capacity to the power grid, and now also shave demand during peak load hours of 6 to 10 p.m.
"We never want to say totally off the grid, because they have that security, too, with GPA, but as efficiency gets better and better, cause with this house right now we could actually add two more batteries if we wanted to and they could go 100 percent off the grid if they wanted to." He said under the homeowner's current power purchase agreement, they're charged 21 cents per kilowatt-hour for solar, which is about 3 cents less than GPA.